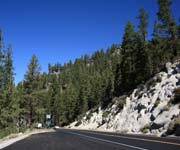 Browse the various transportation services available in Lake Tahoe by Type and Rating! 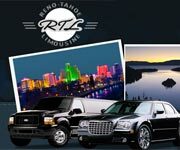 Reno Tahoe Limousine will get you rolling through Lake Tahoe or to and from the Airport in style! What better way to have a stress-free trip than leaving the driving to the pros? 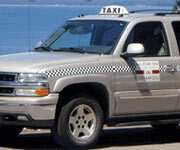 Lake Tahoe taxis can be a great way to get around the area without having to do any stressful planning. 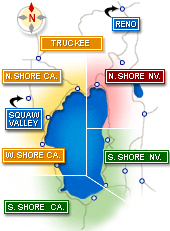 Just book a great Lake Tahoe taxi service and find yourself where you need to be when you need to be there! You can often also save money by using taxis because you skip the rental car fee, those crazy gas prices and the added personal expense of time spent driving around. Taxi Tahoe All-Star Taxi: This great Lake Tahoe transportation service company provides quality transportation in Squaw Valley, North Shore, Truckee and Tahoe & most resort areas with expedient service, reliable drivers and friendly service. They have a reliable flat rate service to/from Reno Airport and drive clean, late model 4 wheel drive SUV's - perfect for all weathers! Anytime Taxi: Providing reliable airport pickup and dropoff and taxi services around North Lake Tahoe and Truckee, Anytime Taxi is always available when you need them. They operate 24/7 for Tahoe travelers who need transportation to everyday activities, special events and even in last minute situations when they come up. Anytime Taxi provides flat rates for Reno Airport transportation in addition to the hourly rates around town and taxi service to the Truckee-Tahoe Airport and the Sacramento Airport. The Bay Area Ski Bus Service runs trips to Lake Tahoe 4 or more days a week for both public and private groups. Reno-Tahoe International Airport transportation options! Once you get the transportation in Lake Tahoe from the airport to your hotel and back figured out, the great Lake Tahoe ski shuttles make it so that you really don't need to worry about transportation for the rest of your trip! To make your trip as smooth as possible plan your airport transportation first. Reno Tahoe Limousine: Family owned and operated for 23 years, Reno Tahoe Limousine has limos serving Truckee, all of Lake Tahoe as well as Reno and Northern Nevada. They also travel to the wine country (Amador/Napa/Sonoma) and as far as San Francisco. They feature private airport transfers, corporate transportation, weddings, bachelor & bachelorette parties, wine tours, and special events. Their fleet is comprised of sedans, SUV's, vans, limousines, ultra stretch SUV Limousines, and Limo/party buses. Squaw Creek Transportation: Getting around the Lake Tahoe area is easy for guests of the Resort at Squaw Creek in North Lake Tahoe near Squaw Valley USA. Squaw Creek Transportation in Lake Tahoe makes it easy to book airport transfers, private charters and tours. Squaw Valley USA Shuttles: This Lake Tahoe transportation service has pickups every morning, recliner seats, video and restrooms. They cater to Reno/South Shore and North Lake Tahoe. Call for reservations and pickup times. Walk-ons are welcome, space permitting. Thinking of buying or selling an aircraft? Teixiera Aviation will transport it! Transportation in Lake Tahoe, including Lake Tahoe airport transportation to and from the Reno-Tahoe Airport, comes in all shapes and sizes including reliable and well-priced taxi services, luxury limousines, private airport shuttles and vans, resort shuttles, group buses and public transportation. Find the most reliable, popular and well-priced taxi services in Lake Tahoe, Lake Tahoe buses and shuttles, and discover Lake Tahoe's trolleys - all in one convenient and reliable place! Transportation services in Truckee, Northstar, Squaw Valley and Soda Springs that get you anywhere, anytime! TART Public Bus -- Taking You Where You Want To Go in North Lake Tahoe / Truckee! The Emerald Bay Trolley Offers A Fun Sightseeing Ride, as it once did when it was called the Nifty Fifty Trolley! BlueGO Lake Tahoe -- Getting You Where You Want To GO! Resort at Squaw Creek Offers Reliable & Convenient Transportation. Taxi Tahoe All-Star Taxi Takes You There. How to get to Lake Tahoe and what are my transportation options getting there? What are my Tahoe airport transportation options from the Tahoe Reno Airport, the Truckee-Tahoe Airport and the South Lake Tahoe Airport? Once in Lake Tahoe, what are my transportation options to get to/from the ski resorts in the winter, getting around Tahoe in the evening when going to a restaurant or bar, or what are the public transportation options in Lake Tahoe? The Reno-Tahoe International Airport is a public and military use airport located in Reno, NV at an elevation of 4,415 ft. and is approximately 60 miles from Lake Tahoe. Its FAA identifier is KRNO. The address is: 2001 E Plumb Ln, Reno, NV 89502 and can be found here: www.renoairport.com. The Truckee-Tahoe Airport is open to the public (meaning private flights OK), is a non-towered airport at an elevation of 5,900 ft. and has main runway dimensions of: 7,000 x 100 ft. / 2,134 x 30 m.  The airport is located just 2 miles east of Truckee, CA and its FAA identifier is KTRK. The address is: 10356 Truckee Airport Rd, Truckee, CA 96161 and can be found here: www.truckeetahoeairport.com. The Lake Tahoe Airport (in South Lake Tahoe) is also open to the public offering services for private flights and is at an elevation of 6,269 ft. They can be found here: http://www.cityofslt.us/index.aspx?nid=182. Its FAA identifier is KTVL. Amtrak: (800) 872-7245 The Lake Tahoe Amtrak depot is located in historic downtown Truckee opposite Commercial Row. Greyhound: (800) 231-2222 The Greyhound depot is located in historic downtown Truckee opposite Commercial Row, with the Amtrak depot. Transportation to and from the airport to points in Lake Tahoe include private hotel shuttles (ask your hotel), commercial shuttles, taxis (very competitively priced or nobody would use them), limos (a nice ride and also well priced) or your best friend's SUV assuming he or she is not on the slopes or at the Lake! Once in Lake Tahoe, what are my transportation options? Renting limousines or hiring out taxis can be great ways to get around Lake Tahoe but for those of you looking for some more budget-friendly transportation in Lake Tahoe, check out these public transportation options! Taxis - See the table above for reliable options. 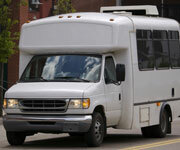 Great option for airport transportation and to and from bars and restaurants at night. TART Bus: Service year round (North and West Shore) between Tahoma and Incline Village Service between Tahoe City and Truckee available, Spring/Summer/Fall Schedule and Winter Schedule are varied. All fares must be paid with exact change, call ahead for fare information. Offers free transfers to the Truckee Trolley and Truckee Connections. Connects with Greyhound and Amtrak at Truckee Depot. Call regarding special event buses and seasonal connections to the South Shore bus system. 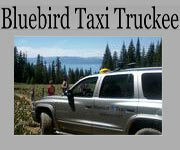 STAGE: South Tahoe Area Ground Express, offers service year round for South Shore Lake Tahoe. BlueGo: BlueGo is a Public Transit System for South Shore, Lake Tahoe with affordable transportation for both locals and tourists. Nifty Fifty Trolley: This South Lake Tahoe trolley takes you on a scenic route around the Lake. 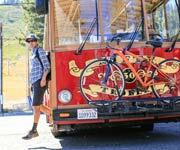 Tahoe Trolley: Running in North Shore, Squaw Valley and Emerald Bay, Tahoe Trolley runs June through September. Truckee Trolley: Open year-round this trolley operates the West End Beach at Donner Lake and the Truckee Airport. Emerald Bay Trolley:  Takes the scenic route from South Shore to Homewood on the West Shore. See this map for more details. *With advance notice the ski resorts may pick-up large groups for no-charge. Not looking for Lake Tahoe transportation information? Check out Tahoe hotels and resorts if you just want to stay put! And don't forget to find out everything you need to know about Lake Tahoe road construction!